Ever wonder exactly the kind of crowd you'll encounter in the early morning hours of Black Friday? According to Foursquare, the popular check-in app, that overnight line of shoppers might not be as bad you think. Contrary to the seemingly ubiquitous notion of Black Friday being a rush of camped out shoppers barreling past employees as retailers fling their doors open for deals, Foursquare found that more people checked in at stores in the 2 pm hour on Black Friday last year than they did in the wee hours of the morning. Yet, we expect this chart to look quite different for Black Friday 2012, since a greater number of stores are opening at around 8 pm on Thanksgiving. For many consumers, this is a more manageable hour to commit to shopping, even if it is technically a holiday. 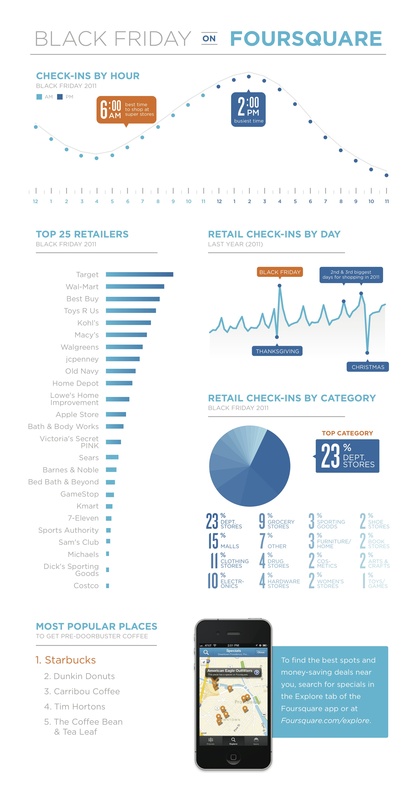 Check out the Foursquare infographic below, and let us know how and when you'll shop this year.